Fixed carbon monoxide gas detector is a kind of intelligent and high-performance gas detector which can continuously monitor carbon monoxide gas and has real-time function. The fixed carbon monoxide gas detector has an overall flameproof structure, stable performance, high sensitivity and precision. Fixed CO gas detector realizes real-time concentration display on the computer through the gas alarm controller and monitoring software, available for measuring range 0-100ppm, 0-500ppm or 0-1000ppm. And can also transmit real-time detection data and alarm status to the safety control center through the optional wireless module. Fixed carbon monoxide gas detector is widely used in metallurgy, petrochemical, municipal, chemical, Marine and other industries. Flammable and explosive hazards may exist in more than 80% of the production areas of the petrochemical industry. Generally speaking, the effective coverage of the gas detector is the plane radius of the water bottle, 7.5 meters indoors and 15 meters outdoors. At least one carbon monoxide gas detector shall be installed in the covered area. In addition, near the inlet and outlet valve group of the storage tank, there are likely to be gas leakage and pump room and compressor room. The valve group in the bottling room shall be equipped with gas detector respectively. 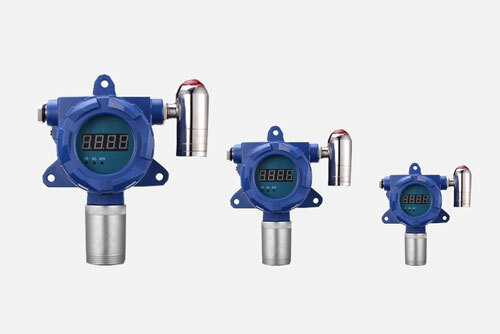 Petrochemical industry detector selection should be based on the production process, in most cases, LEL or IR monitoring flammable gas leakage is necessary to ensure the safety of a certain monitoring range. LEL or IR implement two-level alarm, when the concentration of combustible gas in the monitored area reaches 10%LEL (LEL, that is, the minimum explosion limit) or 20%LEL, the detector will issue a first-level or two-level alarm.